Are you an already certified teacher looking to earn an additional endorsement? 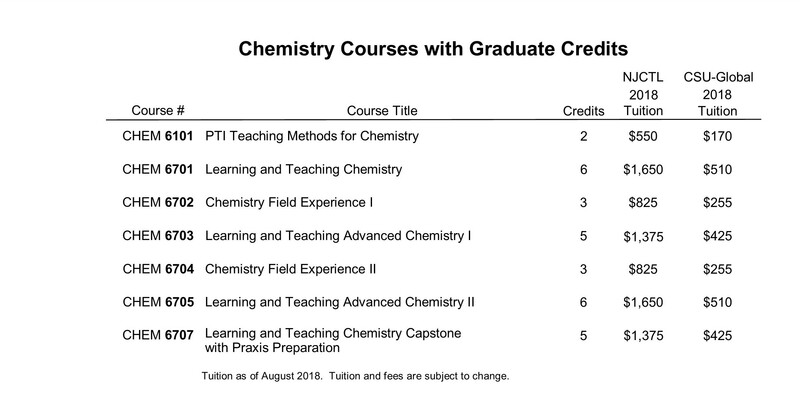 This program provides currently certified, in any subject area, an endorsement to teach chemistry through a combination of NJCTL Online Courses for Teachers; Online Field Experience Courses; and State Teacher Certification (i.e. Praxis) examinations. NJCTL Online Courses for Teachers provide all the required instruction in both chemistry content and teaching methods. While NJCTL Online Courses for Teachers are asynchronous, so they can be taken anytime, anywhere, we recommend starting on suggested dates to be part of a cohort. Also, “virtual office hours” will be in place for each course using Zoom; by being part of a cohort, those Zoom sessions will be more productive. All content courses will be offered completely online through asynchronous courses. Teachers receive classroom coaching as part of the Online Field Experience Courses. Mix and match chemistry courses to meet the teacher endorsement requirements for your state. Contact your state department of education to verify that these courses will properly support your pursuit of an additional endorsement in chemistry in your state. Additionally, individuals who complete the NJCTL Chemistry Teacher Endorsement Program are eligible to go on to complete a Master of Science in Teaching and Learning with Subject Matter Specialization in Chemistry degree with CSU-Global. Click here to learn more about the NJCTL/CSU-Global MSTL with Chemistry Specialization with Chemistry Teacher Endorsement program.